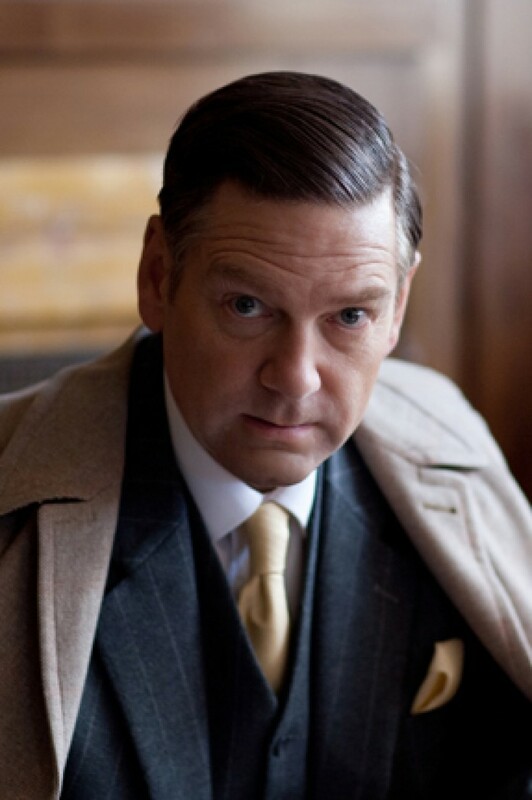 KENNETH BRANAGH stars in "MY WEEK WITH MARILYN." ©Laurence Cendrowicz/ The Weinstein Company. HOLLYWOOD—Early in his career, Kenneth Branagh sent a letter to his idol Sir Laurence Olivier asking him for advice on a role he was about to play. More nerve-wracking than actually sending his query to the famous performer was actually receiving a response from him. The young thespian struggled for several minutes on how best to open the envelope without doing too much damage to it. He looked around for a letter opener but couldn’t find one. So he finally just tore open the flap and pulled out the typewritten letter on fancy blue letterhead. It read: I’m afraid I cannot give you any advice in particular ways in which you should approach this role. It’s up to an actor himself to come up with these individual things. But my advice to you anyway is to have a bash and hope for the best, which I certainly wish for you. Branagh never met the renowned movie and stage actor, who died in 1989, but he kept the letter, which remains one of his prized possessions. Holding Olivier in such high regard, Branagh paused when he was offered the opportunity to portray him in “My Week With Marilyn,” a possibly true account of a young stagehand’s relationship with Marilyn Monroe during the production of “The Prince and the Showgirl,” which was directed and co-starred Olivier. “I did have some concerns but I decided I would just read the script and see,” he says. After speaking with director Simon Curtis about the project, he says he felt confident the movie wouldn’t be a slavish mimicry of Olivier and Monroe, but an exploration of what it might have been like when these two very different personalities and performers were thrown together in the summer of 1956 and had to find a way to work with one another. The thorough Branagh did all he could to prepare to play his real-life hero. He re-watched many of his most notable films and many more films he hadn’t previously seen, including William Wyler’s 1952 romantic drama “Carrie,” and Otto Preminger’s psychological thriller “Bunny Lake is Missing.” He also listened to numerous audiotapes the great actor had recorded, including a dramatic reading of the Bible. “What I was amazed by was the breadth of what he’d done,” recalls Branagh, his blue eyes growing wide. He discovered through his research that even his hero had to pay his dues in Hollywood. It was only when he returned home to England that Olivier gained fame and respect on the stage and in movies. The second time he came to Hollywood, he had better luck, landing the lead role in “Wuthering Heights,” “Rebecca” and “Pride and Prejudice,” among others. He also directed a handful of films, including two films based on William Shakespeare works (“Henry V” and “Hamlet”) as Branagh too has done. Branagh also was awed by his leading lady in “My Week With Marilyn.” He calls Michelle Williams, who plays the blond bombshell, a gem who has managed to capture Monroe’s vulnerable quality. The actor has fellow Brit Terence Stamp to thank for helping him transform into Olivier onscreen. A couple of years ago, Stamp had suggested Branagh treat himself to a pair of expensive handmade shoes for his pending 50th birthday. Branagh took the suggestion and visited George Cleverley, a London-based custom shoemaker that Stamp recommended. In talking to Curtis months later about his wardrobe for “My Week With Marilyn,” Branagh was told by the first-time filmmaker to get a pair of shoes from Cleverleys. Returning to the shop, Branagh noticed a pair of shoes on a shelf identified as custom-made for Olivier. Branagh saw it as a sign. He wound up wearing his own handmade Oxfords in the film, and Curtis even gave the specially designed shoes a brief close up in the movie. “So, thank you Terence Stamp and thank you George Cleverley,” Branagh says, followed by a hearty laugh. While he initially was anxious about playing his acting idol, Branagh has since received affirmation from some colleagues who knew and worked with Olivier—Derek Jacobi and Anthony Hopkins. He also is getting recognition from critics and his peers for his outstanding performance. He has received a Screen Actors Guild nomination as well as nominations from the Hollywood Foreign Press Association (Golden Globes) and the Broadcast Film Critics Association, among others, for his depiction of Olivier. Looking nothing like the swarthy dark-eyed Olivier, the blond, cherub-faced Branagh strived to evoke a certain bone-chilling look the acclaimed thespian could give whenever he was cross. He did his best Olivier “dead eyes” for one scene in the movie when he is discussing his insecurities with Clark. “I’m glad those two fellows thought I passed muster,” he says, smiling.